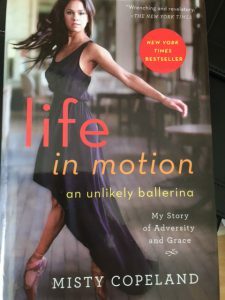 I have just finished reading the Misty Copeland Book – Life in Motion. I love reading true stories about how other people made a success of their lives, and this book is all about Ballerina Misty Copeland, and her struggles growing up and how her determination to succeed as a b allerina made it happen for her. In this Misty Copeland book, Misty tells us the story of her life up until now. I enjoyed the first half of the book a lot better than I enjoyed the last half. I enjoyed reading about her struggles growing up with a large family with five siblings, very little money, and very little chance of success, as she was constantly moved by her Mom whenever the next best opportunity came around. Misty discovers for herself at a young age that she is more flexible than most of her peers, and she dreams of becoming a gymnast. She starts her ballet training very late at the age of 13 and is helped by her teacher and coach who sees her potential. She is even taken in by her ballet teacher to live with her and her family, in order to try and improve her home life, but Misty’s Mom eventually puts her foot down and insists she moves back home. At the age of fifteen, she won first place in the Music Center Spotlight Awards just two years after starting her dance classes which is almost unheard of. She studied at the San Francisco Ballet School and American Ballet Theatre’s Summer Intensive on a full scholarship and was declared ABT’s National Coca-Cola Scholar in 2000. Misty Copeland joined ABT’s Studio Company in September 2000. She joined American Ballet Theatre as a member of the corps de ballet in April 2001, and in August 2007 became the company’s second African American female Soloist and the first in two decades. In June 2015, Misty was promoted to principal dancer, making her the first African-American woman to ever be promoted to the position in the company’s 75-year history. Misty Copeland is well known as a ballerina who defies the odds, as she is a person of colour who is trying to succeed in a white-dominated career. Misty Copeland’s book was an instant New York Times bestseller. Misty Copeland makes history, telling the story of her journey to become the first African-American principal ballerina at the prestigious American Ballet Theatre. The reason that Misty Copeland has made history, is because she became the first African-American principal ballerina at the prestigious American Ballet Theatre. But when she first placed her hands on the barre at an after-school community center, no one expected the undersized, underprivileged, and anxious thirteen-year-old to become one of America’s most groundbreaking dancers. Within months of starting her dance career, she was attempting roles that most dancers take years and years to master. She found refuge in the world of ballet away from the harsh realities of her own life, and it took her a lot of courage to become a one of a kind dancer and success story. This is a wonderful story and memoir for anyone who has dared to dream of a different life. Below is a video of her dancing for the late Prince, whom she regularly appeared with when he was on tour. She also developed a close bond with him, which she talks about in her book. Looking For A Misty Copeland Book To Purchase Online? Here are a few of the Misty Copeland books on offer at Amazon. If you need to find out more about the products, simply click on the photo’s or the blue links. Firebird is Misty Copeland’s debut picture book. She tells of a girl with a fragile ego who questions her own ability to reach the heights that she has reached. Lyrical text paired with bold and striking illustrations that are some of Caldecott Honoree Christopher Myers’s best works, makes Firebird perfect for aspiring ballerinas everywhere. This is the another cover to the book that I have described at the beginning of this post. A great read for anybody who loves to find out more about what it takes to be a ballerina. This is a stunning volume of photographs that captures the sculpturally exquisite and iconic Misty Copeland. Her story is what movies are made of, and in 2015 she became an icon and household name when she became the first African-American female principal dancer in the long and prestigious history the American Ballet Theatre. Copeland’s physique is what sculptures are modeled on, heralding the new physical ideal of strength and athleticism, beauty and grace. This Misty Copeland Book is a collection of gorgeous, artful photographs by celebrated photographer Gregg Delman, taken in many studio visits between 2011 and 2014. Delman’s talent for capturing movement is reflected in these images, which range from formal ballet positions to more athletic poses and candid moments, all together building an intimate portrait of Copeland as an athlete, an artist, and a woman. By clicking on the picture on the left, you can even purchase a Misty Copeland Barbie Doll in her Firebird costume for only $29.99 from Amazon. Her endorsements, past and present, include American Express, COACH, and Diet Dr. Pepper. In 2014, Under Armour launched Misty as one of the faces of their “I Will What I Want” campaign with a commercial that went viral, gaining over 9,000,000 views to date. She received an honorary doctorate from the University of Hartford in November 2014 for her contributions to classical ballet and helping to diversify the art form.